Price: from 550 000 rubles, depending on the oven configuration and the quantity purchased. 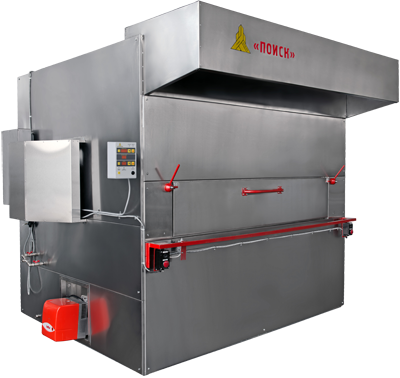 The POISK tray oven is designed for the manufacture of a wide range of bakery and confectionery products from various grades of wheat and rye flour (pan bread, hearth bread, long loaves, small goods, biscuits, etc.). Bakers have an opinion that foods baked in tray ovens are more delicious, aromatic and beautiful than in other ones, thanks to the natural bakery process and the absence of aggressive air-blow of dough products, that is, the products pass through all temperature zones smoothly due to the rotation of the tray conveyor. Our tray oven can operate without reconfiguration, simultaneously on gas or diesel fuel. The time to reconfigure the oven from diesel to gas and vice versa takes 30 minutes. Small goods are baked using trays with a capacity of 50 kg per baking operation (≈20 min). As an energy carrier, low-pressure natural gas, liquefied gas or diesel fuel are used (they are interchangeable). The use of a tray conveyor makes it possible to ensure a good uniform baking of all the products, since the dough products are in the same temperature conditions (there is no temperature level difference since the trays move from top to bottom and vice versa). The steam generator provides the required quantity of steam (the amount of water supply is adjusted). A power unit, a tray-rotor conveyor, facing panels, a load/unload unit with a door. Heating of the baking chamber is made through the burner. Combustion products are discharged through the gas flue into the atmosphere. Open fire and combustion products are isolated from the baking chamber space. The oven body is made of steel, has a multilayer thermal insulation, thanks to which the external parts of the body do not heat above 40 ºC. The reliability of the operation of our oven is ensured by the fact that all loaded rotating mechanisms are located outside of the heated zone and operate in a lite mode. We are manufacturers and developers (changes are made based on the work of the Service Department every 3-4 months). The baked products have a high quality. This particularly refers to pan bread, including rye-wheat grades. — when the power is turned off, the trays can be rotated by hand for finishing the baking process. — all components are of domestic production: they are available for purchase at low cost. — at start-up, we train customer’s representatives on maintenance issues and we are always ready to consult them. — the keyboard is easily updated to a new one (the cost is 100 rubles). The multi-layer structure of the thermal insulation ensures heating of the outer walls of the oven body no higher than 40 °C. The unique design of the burner allows adjusting the uniformity of baking of all the dough products. Low energy consumption by reducing its loss, especially compared to rotary ovens (with open door). The equipment is delivered both assembled and disassembled (assembly directly at the customer’s site). There is low cost due to the fact that everything is developed and manufactured at our enterprise. We constantly work on reducing costs. Simplicity of loading-unloading.The ovens are loaded both using a forklift and a crane or a crane beam. For that, they are equipped with appropriate lifting ears. Details and prices can be specified by phone (8634) 311-832 or through ordering a free call back at a time which is convenient for you, simply by pressing the button «Order a call back» at the top of the page or by clicking on the handset in the lower right corner, leaving your contact phone number if you want to be called back during a few seconds. Our manager will advise you on all issues related to POISK tray ovens. LLC PKP «BAK» provides its customers with reviews from operating bakeries and bread-baking plants on the supplied bakery equipment. We guarantee the quality and reliability of POISK tray ovens by LLC PKP «BAK».